The Adaptive Cities team will shortly be rolling out an initial set of Adaptive City SmartPanels. These panels will be used to display travel information in the lobbies of public buildings to help inform travel choices. 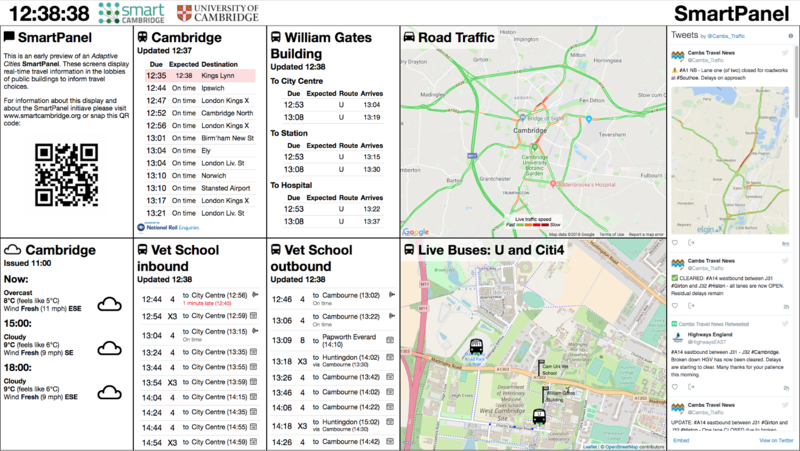 They take advantage of the real-time processing capabilities of the Adaptive Cities platform to make up-to-the-minuite information available to the travelling public. As such they are an early example of some of the things that the Adaptive Cities platform can achieve. Panels are geo-located to automatically display relevant information and can be further customised by local managers. The Adaptive Cities program would be really interested to here your comments on these panels and on how they could be further developed. Please join in the conversation here. Last edited by: jw35 on March 15, 2018, 12:51 p.m., edited 1 time in total. By: jw35 on March 21, 2018, 9:25 a.m. The first of these 'SmartPanels' has been deployed. It's at Shire Hall.